Vichai Sriprasert, president of Riceland International Co, is among the handful of Thais exploring farming opportunities in Africa. Globalisation may be eroding some boundaries in world business but barriers definitely remain in place for agriculture. In Thailand, as in many developing countries, agriculture is seen as the nation's backbone. The emergence of foreign investors is therefore controversial. "I personally have few worries about the issue, considering the effective protection offered by our laws," said Ananta Dalodom, a former director-general of the Agriculture Department. Thailand's Foreign Business Act includes farming among the sectors reserved for Thai nationals. In his view, though, foreign investors are no cause for concern. Thailand should consider opening up the sector, according to the expertise and investment it needs. "Whether we need extensive research and development for better plant varieties, or whether we need partnerships to help explore global markets - if we need it and the country benefits from it, foreign investment should be welcome," said Dr Ananta. Agriculture is a strong sector, which survived the 1997 crisis and has been affected less than others by the current global recession. The boom in energy crops that triggered global fears of a food shortage last year has also raised Thailand's profile as a leading supplier and exporter of several farm products, including rice, tapioca, rubber, chicken and shrimp. Last year, Thailand sold more than 10 million tonnes of rice and many countries imported much larger volumes - especially Nigeria, which bought more than 800,000 tonnes of rice, a 158% rise on the year before. While foreign involvement in Thai farming could be unpopular, many Thai agriculture companies are seeking opportunities abroad, particularly in neighbouring countries. Large companies such as Charoen Pokphand Group (CP) and Thai Charoen Corporation Group (TCC) have farm investments in Laos, Cambodia and Vietnam. Plantheon Co, a subsidiary of TCC, has formed joint ventures with local partners to grow coffee in Laos and palm oil in Cambodia. CP is among the first Thai corporations to grow maize in the region to support its livestock business. It plans to increase its plantation area to more than 3 million rai in Laos, Cambodia, Vietnam and Burma in the near future. Dr Ananta, also an adviser to the TCC Group, warns that those planning investment abroad should understand local culture and avoid hurting local sensitivities. "The investment should avoid any plans to encroach on and damage the fertility of the land. I was not feeling good when I heard that some Thai investors destroyed a large forest," said Dr Ananta. Thailand's reputation for cultivating many food crops, especially rice, has encouraged foreign companies to involve Thai businesspeople in growing and processing rice abroad. 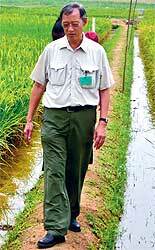 Some countries in Africa, the world's big rice market, have invited foreigners to grow rice, said Vichai Sriprasert, president of Riceland International Co.
To reduce its dependence on rice imports, Nigeria allows foreigners to lease land for growing rice and to run rice-related businesses including milling and processing. Nigeria imports about 2 million tonnes a year, or half of its total consumption.